Create Your Own Map: Great for kids and kids at heart, our blank US state map allows you to unplug and explore your creativity! Beautifully intricate designs provide hours of entertainment, while the large 32×24″ size means multiple people can color together. Education Made Easy: From New York to California, our blank map features all 50 states, introducing kids to their names and locations! It’s a fun, engaging way to learn, and once it’s all filled in, it makes a one-of-a-kind study aid for homes and classrooms. Designed for Versatility: Printed on durable 20lb bond paper, our map handles a wide range of art media including colored pencils, markers and crayons! Complete with a 3/4″ boarder, it’s ready to hang or frame for artwork that’s both personal and rewarding. Premium Quality: Designed, printed and shipped from the United States, our blank map of America is one purchase you can feel good about! Each one is rolled and packaged in a rigid cardboard container, ensuring it arrives to you rip, wrinkle and damage-free. Shop Risk Free: At Winding Paths Art, we want to help you unleash your inner artist! If for any reason you’re not completely satisfied with your coloring map of USA, just let us know. We’re offering a full 30-day money back guarantee on all of our products. The Fun, Approachable Way to Learn US Geography! For kids, learning geography is often a daunting task. With unfamiliar names, difficult spellings and oddly shaped state borders, it’s no surprise that students find the subject frustrating, boring and confusing. With a USA Coloring Map by Winding Paths Art, kids can have fun while they learn! Featuring elaborate designs of stars, stripes and polka dots, budding artists can let their imaginations run wild. Measuring 32×24,” they’ll love coloring on the wall or on the floor, and because it’s so huge, friends and family can join in too! The best part? Kids learn while expressing themselves creatively! Featuring all 50 states, they’ll become familiar with their locations, names and spellings in a way that’s engaging. When they finish coloring, you’re left with a unique artwork that doubles as a teaching aid. Each one ships in a protective tube, ensuring it arrives safe, sound and wrinkle-free. A large kids coloring book with 25 pages of fun and engaging activities! Kids will love THIS PATTERN CARTOON COLORING, The appealing artwork are eye-catching and child-friendly. This book is sure to engage little ones for hours! Your child, or any child in your life, will love to celebrate their love of learning by filling the pages of this coloring book with bright colors. Give them a great activity that sparks their creativity, improve brain function, and yes! create imagination and keeps them busy and entertained for hours. This coloring book is a great value at 25 pages long. Each page contains one or more high quality images for little ones to color. 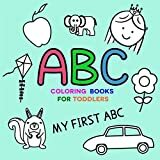 ABC Coloring Books For Toddlers: My First ABC Start your early childhood education today with this easy toddler coloring book. Your kids will find lot’s of coloring fun in this alphabet coloring book. The coloring pages combine fun and learning. Children will love to fill the pages with colors and learn the alphabet at the same time. The coloring pages keep little ones busy and entertained for hours. In The HOMESCHOOL LIFE COLORING BOOK you’ll find these and 40 more of the funniest, wisest and truest stress-reducing, laugh-inducing designs a homeschooler could ever color. You’ll be the envy of everyone in your support group as you chill, color and share these humorous insights, homeschool urban legends, and inspirational quotations on fun-to-color kaleidoscopic backgrounds. If you’re a homeschooler, YOU need this coloring book… as in RIGHT NOW! The word ‘Home’ has a special meaning. It is a place of love and respect. Teach your children how to also make it safe with the Home safety Coloring and Activity Book. In this helpful coloring book, kids go on a home safety patrol room-by-room to make their homes safer. As they color each of the 16 pages, kids will learn valuable lessons that will keep them from harm! Recommended for children ages 3 and up. Ideal for insurance, realtors, schools, day care centers, and alarm companies.